The links we make online matter. Whether they are simply celebrities of interest or connections to loved ones, these data tell the stories that mark the histories and current lives of online users. Yet these links do not belong to the users, but to the data controllers, such as Facebook and Twitter. This unintentionally makes egocentered networks political objects. The central political issue is who owns these networks and what rights do users have to the edges that connect users? In this presentation, I review the history of visualizing egocentric Facebook networks, detailing the popular works FriendWheel and TouchGraph as well as later incarnations such as Wolfram Alpha, Algopol, NameGenWeb and CollegeConnect. I note how this egocentric work is no longer possible due to API changes and highlight the losses that this will incur in the research community. I detail the specific goals behind these visualizations and chart the insights that they have proffered. I contend that different projections not only provide users with insight but that they may be a means to generating additional social capital and future academic research questions. Their absence heightens the importance of self-reported personal network tools, such as VennMaker and NetCanvas as well as alternate mechanisms for accessing trace data. 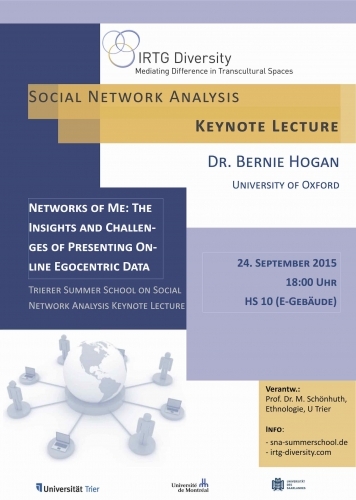 Bernie Hogan is a sociologist and Research Fellow at the Oxford Internet Institute at the University of Oxford. His work focuses on online relationships and the joint use of multiple media. He has studied participation on Wikipedia, pseudonyms on Twitter, and egonetworks on Facebook among others. Additionally, Bernie focuses on novel methodologies for understanding and representing social networks, both online and offline. His work is published in dozens of book chapters and peer-reviewed papers. He received his PhD from the University of Toronto in 2009.